Where’s My Water by Disney Interactive Studios is an iOS game for iPad and iPhone with easy controls, bright graphics and catchy tunes, that make its gameplay a delight. Is there really an alligator living in your sewer? There is if you purchase Where’s My Water from the App Store. From the start of the app, Where’s My Water is enjoyable and simply entertaining. Swampy the Alligator is alive and well in the sewers beneath the city and is in desperate need of water for his shower. 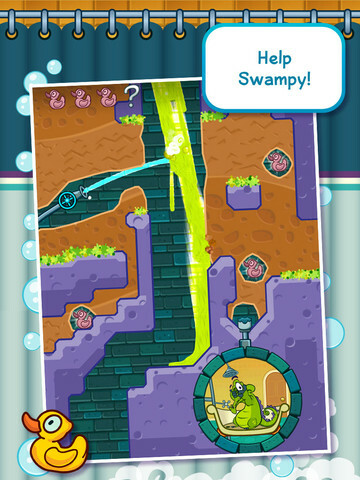 By digging tunnels and directing the water flow, players ‘fill’ Swampy’s tub and earn points while clearing levels. There are four levels currently available in the application, three of which are locked when you begin play. The graphics of the app are simple and a bit childlike but not enough so that adult players feel like they are playing an app made strictly for children. The purple earth stands out from the brown dirt that one must get rid of to allow the water to flow freely. Swampy is an entertaining character done in bright green. Fail to fill Swampy’s tub quickly enough and he will bang on the shower head slightly grumbling to himself; it’s worth it to mess up a level a time or two just to see the frustration on his face. Scoring is based on your time, what is called an overflow bonus and the number of ducks you cover with water; there are three ducks per level. 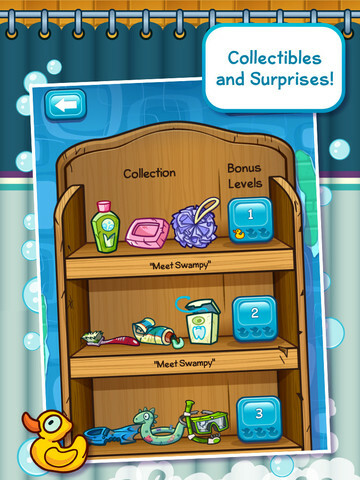 The faster you can make the water reach Swampy’s tub, the better your score. Cover all three ducks and have enough water left over for overflow and you’ll rise quickly through the scoreboard. The sound effects of the app are cute and sure to keep children smiling and humming along. Adults may find the music a bit redundant but, thankfully, the sound effects and Swampy’s occasional mumblings outweigh what would be an annoying backdrop to the app. From the main menu, the settings icon will allow you to turn the music on or off. The developers may want to separate volume controls for the music and sound effects rather than the all or nothing approach currently available. The $0.99 price tag makes the Where’s My Water app more than worth the purchase. More levels are promised soon and the increasing difficulty is sure to have players doing their best to make it through the levels for days. The iPhone app is currently available for the iPod Touch and iPad as well and is a fantastic value for the money. With over 1,000 positive reviews and an average 5 star rating on iTunes, the app is sure to continue winning over gamers of all ages. AppSafari review of Where’s My Water? was written by Darius Reimm on September 26th, 2011 and categorized under App Store, Fun, Games, Puzzler. Page viewed 5724 times, 4 so far today. Need help on using these apps? Please read the Help Page.